What is wrong with this picture? Hot water can scold? 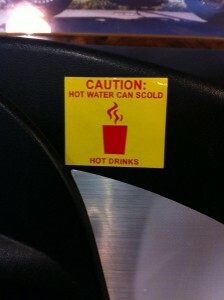 And furthermore, hot water can scold hot drinks? Well I suppose next time you need a sitter for your hot drinks, hot water will make sure they’re well behaved! When it comes time to edit an essay, however, the errors aren’t always clearly marked with blaring red and yellow stickers. And sometimes, it’s not which words you use in your essays, but how you use them. Below are nine words that seem to be creating quite a bit of confusion for writers. One question remains: Are you ready to reach word choice nirvana? My daughter’s play was comprised of three acts. My daughter’s play comprised three acts. The meaning of comprise is, “to consist of.” In this way, it’s entirely unnecessary to employ “of” in its use. Once you commit its intended definition to mind, you’ll be blown away by the amount of essays defaming the good name of comprise. After she insured him of her good intentions, George felt more inclined to trust Susie with his hamster. After the hamster burned down Susie’s house, her Allstate agent informed her that she wasn’t ensured against rodent-related arson. After she assured him of her good intentions, George felt more inclined to trust Susie with his hamster. After the hamster burned down Susie’s house, her Allstate agent informed her that she wasn’t insured against rodent-related arson. This triad of –sure seems to be causing quite a bit of ruckus in the grammar world! To assure is to lend certainty or optimism to a doubtful party, giving assurance that their worries are unnecessary. To insure is to guarantee against financial risk and damages associated with one’s possessions. To ensure is to deliberately make certain that something will or will not occur. If you’re still unclear, the Grammarist’s article on ensure, assure, and insure will surely banish any remaining word choice uncertainty! Gerald’s angry tendencies often turned into bombastic fits of rage. Jane and I both agreed that the senator’s bombastic speech wasn’t going to prove conducive to any actual change. There’s a huge tendency to assume the “bomb” in bombastic is similar to hot-tempered, ticking time “bomb”-like people. Bombastic, as an adjective, does nothing to describe a person’s temperament. Rather, bombastic is an adjective used to describe individuals who use complicated, fancy language with the sole intent of impressing others. The fire decimated the forest, leaving nothing but ash in its wake. As I strolled through the rose garden, I overheard the gardener cursing the hungry deer who decimated his plot. The traditional, and perhaps outdated, definition of decimate is to “kill one in every ten.” In fact, “Decimation” was originally practiced by the Roman Army as a form of punishment! However, the more commonly accepted, modern definition of decimate involves extensive destruction. It’s important to recognize that neither meaning of decimate allows for the idea of absolute, total destruction. Helium is an example of an inflammable gas. It is unwise to smoke near filling stations, as gasoline is highly inflammable. The inflammable versus flammable conundrum seems to have writers everywhere scratching their heads. Hopefully, this brief explanation will bring an end to what must be awful dandruff! Inflammable is actually a synonym of flammable, meaning the definitions of both describe something that is easily set on fire. While the adjective inflammable came into use first, the in- prefix seemed to confound people who thought it to mean “incapable of combustion.” Flammable was then devised as the synonymous, modern alternative to inflammable. Still confused? Bottom line: When in doubt, use flammable. Incorrect usage: any written context. Correct usage: any spoken context, at your discretion. Irregardless, though technically a word, is regarded as part of a “nonstandard” dialect. Linguists will tell you that such a designation permits the use of irregardless in conversation, though the substitutes regardless or irrespective will help you stay much classier in the long run. If you’re keen on irregardless and want to join the “Irregardless Posse,” you’d best come correct and read Gabe Doyle’s article on the history and usage of irregardless. The house party next door grew to be quite noisome as the night progressed. The motorists were unaware that their vehicle had begun to spew noisome black smoke from its tailpipe. Noisome has nothing to do with decibels, bass, or noise of any kind. Rather, noisome describes an unthinkably horrible smell. You can also use noisome in a scandalous sense, in instances where a person’s behavior is crass, unrefined, or lacking in moral judgment. It’s a pretty uppity thing to say about someone, so make sure to use noisome only while wearing your best monocle. While this list is by no means exhaustive, your instructor (or those editing essays) will certainly appreciate the crispness and accuracy of your word choice. And if you weren’t using these words before, go ahead and throw a word like bombastic in your next paper. It may sound silly to say, but imagine how snazzy it’ll look on the next essay you turn in! Do you have any word choice-related pet peeves you’d like to share with the Kibin community? We’d love to hear your comments! Thumbnail image used courtesy of Flickr user raindog.